The Zero’s No Hero Here. Bias Abounds. Above picture from the Oregonian. I’m not a big fan of the feds telling locals how to do their jobs but, let’s be honest, there are some good things about No Child Left Behind. Holding teachers accountable for imparting knowledge that kids need to know and testing those kids to make sure they learn is the least we can do. The teachers union hates it. I understand. There are many TERRIFIC teachers in Oregon and for them NCLB dumbs down the process because THEY CAN DO BETTER. Alas, not all teachers are so great, hence NCLB. 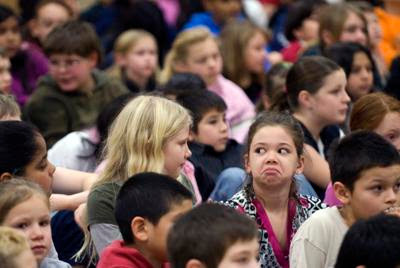 But lest you wonder what The Zero feels about NCLB just look at the picture they chose to run taken during a speech by the Education Secretary Margaret Spelling in Portland. No bias here. Sure.